“The good school” is the title of the reform to the Italian educational system proposed by the Prime Minister Matteo Renzi that was approved by the lower chamber of parliament on the 20th of May and that now needs to be approved by the upper chamber in the next few weeks. In the words of the Ministry of Education Stefania Giannini the reform is aimed at improving “autonomy, transparency, responsibility, fair valuation and merits” in the educational system. The reforms involve funding for hiring thousands of temporary teachers on permanent contracts, more training, the introduction of a one year trial for new teachers and larger school autonomy among other – sometimes controversial – measures. It’s too early to say whether the reform will achieve its goals, but improvements in the sector are needed. The Italian education system provides a nearly universal public schooling that produces some of the top performing students in the world at age 15, but it also produces too few people with a tertiary degree, has poor infrastructure, and student performance in some regions are extremely poor. The proportion of public spending on education is dramatically smaller in Italy than in other advanced countries, at just over half the OECD average. 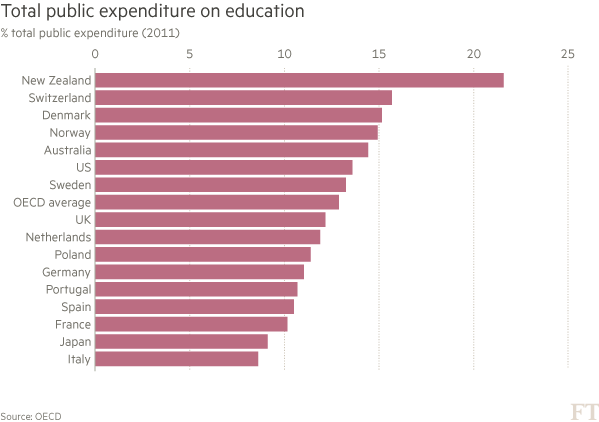 Moreover, Italy is the only country where real public expenditure on educational institutions fell between 2000 and 2011. While public resources invested in Italian schools and universities were 3 per cent lower in 2011 than in 2000, they increased by 38 per cent in the OECD as a whole. And the fall is even larger than that in overall public expenditure, meaning that the small share allocated to education is shrinking further. The main savings came from reducing the salary cost per student in primary and secondary schools. This resulted mainly from an increase in the number of students per teacher and a reduction in real teachers’ salaries. In order to change the ratio of students per teacher, retiring teachers were not replaced resulting in an ageing teaching force. The vast majority of teachers are now over 50 years old. However, despite the increase in ratio, there are still fewer Italian students per teacher and teaching time is less across all levels of education than the average in OECD countries. Somewhat more alarming is the control of spending through the delay of capital expenditure, such as the construction and renovation of buildings or the purchase of new equipment. 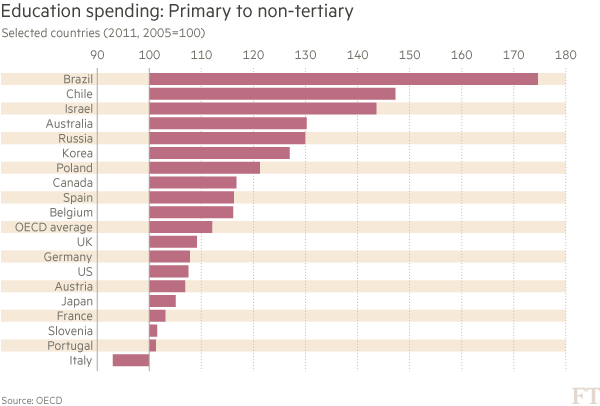 This represents less than 4 per cent of total expenditure, one of the lowest proportions among advanced countries. This is despite the need capital investment. As the OECD PISA assessment states “all schools in Italy suffer from poor physical infrastructure”. With the reform school principals will have larger autonomy. 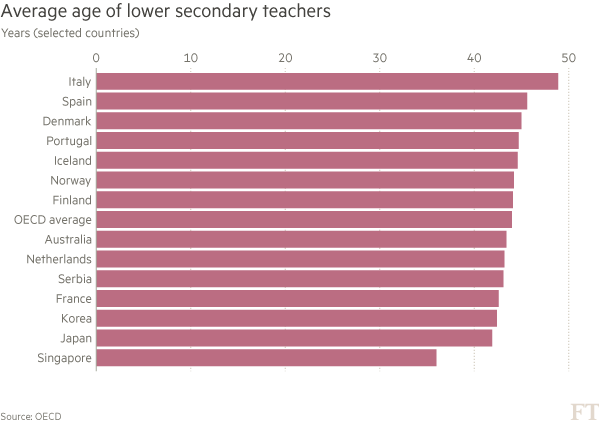 In Italy nearly 90 per cent of the students attend schools where only national or regional authorities are responsible for hiring teachers, a much higher proportion than the 24 per cent OECD average. Italian schools have the same lack of autonomy when firing teachers or setting salaries. Teachers will also receive salary increases and progress in their career due to merit as well as length of service. It’s not clear how the merit will be measured, but surely Italian schools are behind other countries in using students’ assessments to judge teachers’ effectiveness. Only 30 per cent of students attend schools where achievement data is tracked over time, the second smallest proportion among all advanced countries after Japan. It is not surprising then that the Italian educational system performs below international standards, at least on some measures. The proportion of the mid 20s- and mid 30s population with tertiary education in Italy is about half that of the UK, the US or Spain and the proportion has not been increasing as rapidly as in other countries. In fact, with the economic crisis school enrollment has even decreased both in secondary and tertiary education. 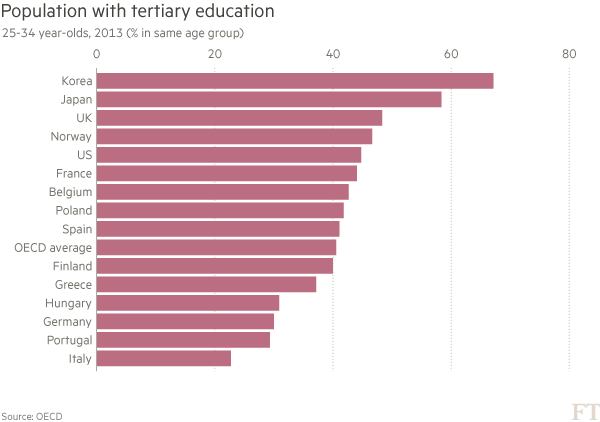 In 2012 only 86 per cent of 17-year old Italians were still in education, one of the smallest proportions among advanced countries. And for those that do go to school, results naturally tend to be poor. Italian 15-year old students perform below the OECD average in terms of reading, maths and science, despite one of the fastest improvements since 2003. Actually, in some regions, Italians students are among the best-performing students in the world, specifically, students in the northern regions of Trento, Friuli Venezia Giulia and Veneto. 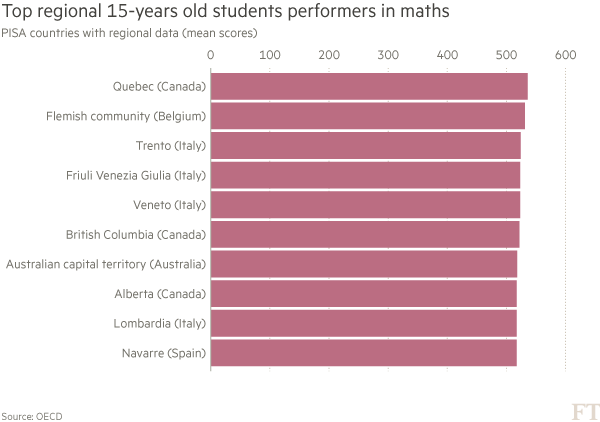 On the other hand, in the southern region of Calabria, over 20 per cent of students achieved only the lowest level in mathematics. 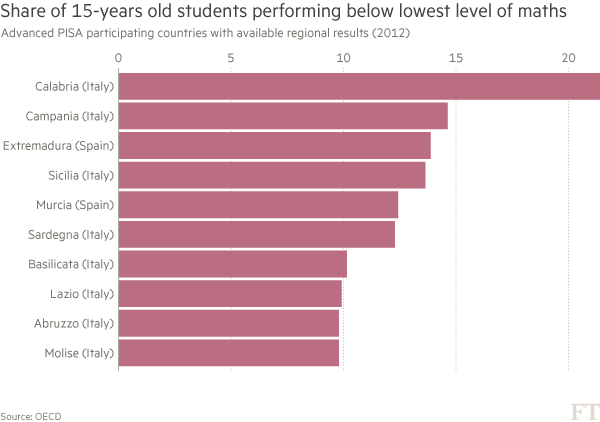 Only students in some regions in Latin America had similar proportion of low performing students. Immigration is also a new challenge for Italian schools. While Italy still has a smaller proportion of immigrant students than other European countries, the proportion grew rapidly in the last decade. Possibly because of the recent inflow, the performance gap between immigrant and non-immigrant students is wider in Italy. The Italian educational system needs to produce a larger proportion of students with a tertiary degree, it needs better buildings and equipment, and the quality of primary and secondary education needs to be more even across regions. Let’s hope that “the good school” will help achieve that.